From the outside, Patisserie Sebastien, a neighbourhood French bakery, doesn’t seem too Parisian. 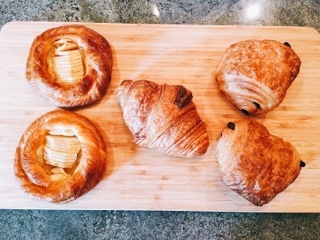 However, once you open the oversized door (perfect for strollers and assisted walkers), the smell of tantalizing buttery pastries and comforting espresso mixed with milk instantly greets you. Sebaastien’s is busy but not in an overwhelming manner: there’s always someone occupying the handful of tables situated around the windows but I’ve never had to wait. If you’re there for just a sweet and drink, a row of stools by the coffee bar entices you to stay and enjoy the concoctions in their full glory. 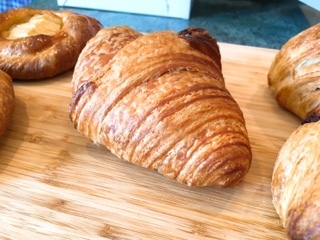 In fact, I highly recommend you stop and eat the pastry there as certain ones are not nearly as magnificent once suffocated in a paper bag and left sitting around at home. 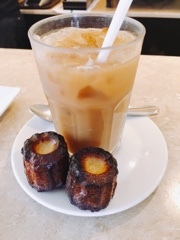 At the restaurant, the canale ($2.95) has a wonderfully caramelized crust and airy sweet cakey custard centre… the ideal two bites of sweetness with a hot frothy cappuccino. Once they’re brought home and especially if they’re left overnight, they’re still good but becomes chewy. 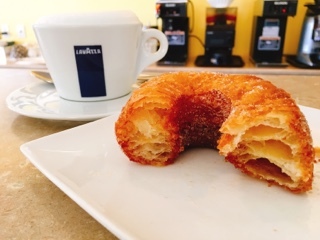 Go early on Saturday for your best chance at getting one of their French doughnuts ($2.95). Even then, sometimes they can quickly run out when families run in to grab a dozen for the cottage and there won’t be another batch on Sunday. Sebastien’s take on a cronut, these doughnuts are sinfully delicious with layers of flaky buttery pastry with a crispy sugary crust. By far my favourite doughnuts in the city. Their butter croissant ($2.25) incorporates the same airy dough but really needs some condiments as it’s not really flavourful. For those who like croissant sandwiches, this is ideal for stuffing with cheese, vegetables, and meat. 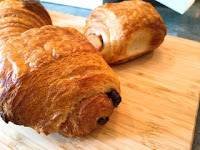 Similarly, the chocolate croissant ($2.50) is not nearly decadent enough. With only two slivers of chocolate along the middle of the pastry, you don’t always get some with each bite – if there was a bit drizzled on top the pastry would be better. 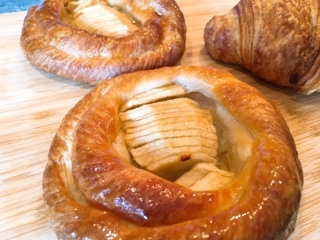 I prefer the apple Danish ($3.10), topped with numerous thin apple slices and a sweet earthy almond paste underneath. This is a pastry you generally can’t find everywhere else. 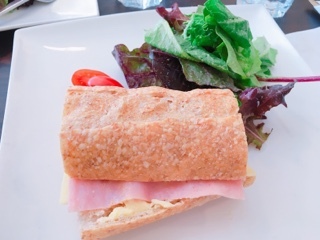 For a light lunch, Sebastien also offers sandwiches, soups, and quiches. 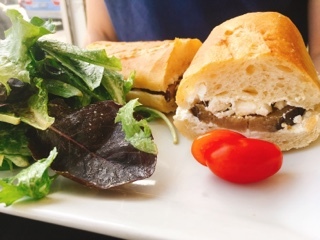 The baguette used as the sandwich’s base is delicious – soft, chewy, and has a lovely bread aroma; it’s a crusty bread that’s not hard so you won’t have the jagged shards that can cut your mouth. Meanwhile, the sandwiches’ fillings can be improved. The Parisian ($9.50; half order pictured below as they thoughtfully split it for us) uses French style ham, gruyere and mustard. Nothing is strong enough so the flavours sort of just meld together: the ham isn’t smoked and the gruyere also fairly mild. The only saving grace is the lovely mustardy creamy vinaigrette on the salad … if devil's egg can be made into a dressing. The legume sandwich ($9.50) could be good if the eggplant was hot. Maybe it’s me, but biting into a bun and being greeted by an ice-cold vegetable is a letdown, no matter how creamy the goat cheese. 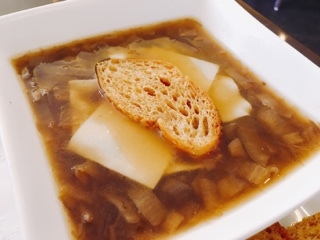 Sebastien’s French onion soup ($8.95) has all the elements to satisfy without the guilt factor. In lieu of the cap of cheese and bread, a few slices of gruyere is laid on top so it slowly melts without leaving a pool of oil. Baguette croutons are served on the side so you can add them gradually to the soup to help retain some crispiness. Given the accompaniments are lighter, the broth gets a chance to stand out - it’s not overly salty so you can enjoy the sweet onions. 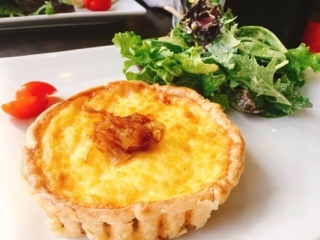 Of all the brunch dishes, my favourite is their individual quiches – combining a bite of flaky crust and savoury egg with each bite. Their quiche Lorraine ($9.50) incorporates plenty of ham and cheese so is flavourful and creates nice gooey bites with caramelized onion for sweetness. The quiche’s crust is flakey but still light enough to not feel heavy, especially when balanced with the same mustardy aioli vinaigrette salad that’s served with sandwiches. 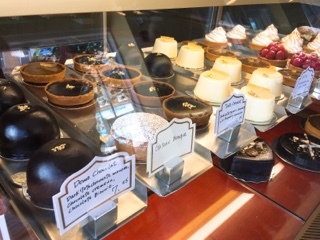 What I like most about Patisserie Sebastien is that there really is a Sebastien. When it’s busy, he’s generally in the kitchen, preparing the baked goods, sandwich, quiche, and soup orders. Once in a while, he’ll make his appearance in the dining room, bringing over the food in a quiet non-opposing manner. It’s impressive the number of confections one person can create for a bakery. Splitting a soup and French doughnut with my own quiche, that’s my go-to weekend lunch treat.